KW-120-THX Subwoofer (20-200 Hz +/- 3db). Illustration courtesy of Klipsch Group, Inc.
Subwoofers are quite popular in home theater systems, vehicles and for home computer audio systems. Typically, these systems are not equivalent in sound quality (fidelity) to a good, two channel, home stereo system intended for the most accurate possible music reproduction. 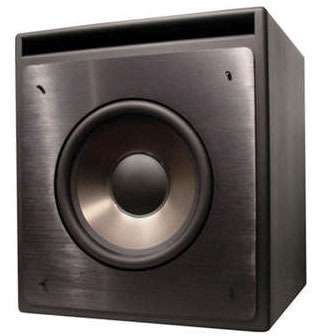 A subwoofer may be desirable when the basic system cannot adequately reproduce the lower octaves. However, be aware that it adds expense, complexity and an additional cross-over point to the speaker system, all of which are undesirable if adequate bass response can be achieved without a subwoofer. Any subwoofer worthy of the name should be able to reach down to at least 30 Hz (-3db or less). When choosing a subwoofer, the main thing is to buy the best quality you can afford and get one with a substantially larger driver than your other speakers have. For example, if your base system uses 8" woofers, get a subwoofer with a 12" (or larger) driver. If your main speakers use 10" woofers, your subwoofer should be 14" or larger. For best performance, subwoofers should use the largest possible enclosures consistent with their design. Size matters when reproducing low frequencies, both in terms of the driver and the enclosure. Good subwoofers are available from Klipsch, B&W, Paradigm, Cerwin-Vega, Warfdale, PSB, JBL, Electro-Voice and others. Make sure you have adequate amplifier power to drive a subwoofer, or get one that incorporates its own power amplifier. Reproducing the lowest frequencies requires a lot more power than reproducing higher frequencies, because of the great physical length of their sound pressure waves. Of course, the speaker cabinets must be properly designed and large enough to allow the woofers to operate as designed. Large enclosures are best for full range loudspeakers intended to adequately reproduce low frequencies. There are many adequate, full range loudspeakers on the market. However, they are usually floorstanding types and generally not cheap. Full range loudspeakers available at various, but not the highest, price points include the Klipsch RF-7 II, B&W 803 Diamond, Paradigm Studio 100, PSB Synchrony One, Cerwin-Vega CMX-212, Warfdale Diamond 159 and Vandersteen Quatro. These are examples of loudspeakers that should eliminate the need for a subwoofer . The most impressive subwoofer I have ever heard used an Electro-Voice 30" woofer in a huge (probably around 5'x5'x5') box. THAT was a subwoofer! It could reproduce frequencies well below audibility and literally shook the walls and floor of a very large room with the internal volume of a medium size house. Most of us don't need that much low frequency extension or volume.